While there are any number of public policy changes that could address the problem, group health and workers’ comp payers can’t wait for legislative or regulatory action – they need solutions now. First, we have to know why and where prices are increasing to come up with viable solutions. The study referenced above used case-mix adjusted data from 3 large health insurers – Aetna, Humana, and UnitedHealthcare, using the actual prices negotiated by these giant healthplans. (these plans cover over a quarter of all Americans with employer-sponsored health insurance.) I won’t get into the nits of the research – for wonks, it’s all in the link (subscription required). 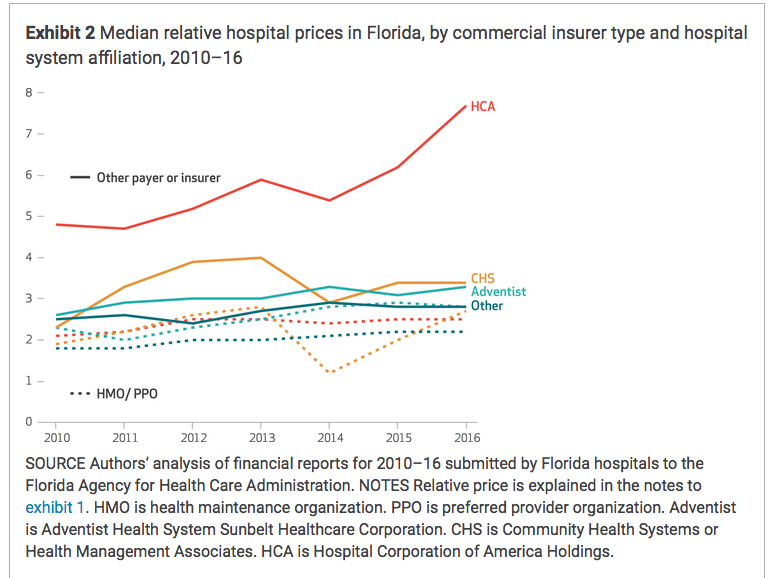 Hospitals and health systems are able to raise prices because – in many areas – they have close to monopolistic pricing power. That is, even giant health insurers aren’t able to negotiate low prices because health systems have dominant market share. other insurers [defined as auto and work comp] typically lack sufficient patient volume to establish network contracts with hospitals because they usually insure only a small proportion of a hospital’s patients. The solid line shows prices that “other payers” including auto and workers’ comp – pay; the dotted lines are what HMOs and PPOs pay. Tomorrow, we’ll focus on cutting costs on individual bills. Work comp and auto is a very soft target for profit-maximizing providers – but you aren’t powerless. Previous Previous post: What do YOU think about work comp UR?